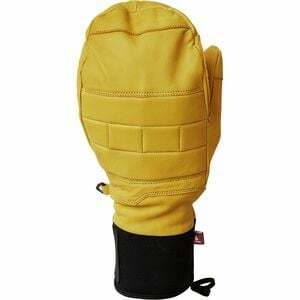 Product Condition: The Smitty Mitten is in Good condition. This item was previously owned for 2 weeks. The following observations were made concerning this item. The way you sail down the mountainâ€”bounding over rocks, threading the needle through tight trees, hiking to get the sickest line you canâ€”is pretty rugged. You need a glove that's as tough as you are, and you've got it with the Flylow Smitty Mitten. Made with triple-baked cowhide leather and reinforced with impact-resistant foam on the back of the hand, this mitten won't shy away from your daily routine of dropping cliffs and ripping it in the woods. You'll also be able to stay out on the coldest of days with ultra-warm Primaloft insulation keeping your hands nice and toasty while you ride.